We’ve begun the buildout! With enough money raised for Phase 1, we’re watching our dreams become more of a reality every day. Who would have thought we’d be so delighted to see plumbing spring up through the floor while electric cables and outlets snake through concrete and climb the walls? Who would have expected neighbors stopping by to wish us well? Who would believe our vision to create an organic garden in the back and a “living wall” in the front? Who would imagine even more talented Northwest artists, architects, and builders coming together to create a visionary storefront? That’s right…art on the outside walls as well as on the inside. And who would have ever believed we would successfully raise the initial $40K (all from donations) we needed to begin? Well, that answer is simple. We believe…as do our 74 MAAG members (and growing) and our northwest neighbors, businesses, and friends. So, what’s next aside from closing up the floors and creating the emergency exit out back? It’s raising money for Phase 2 . That means walls and bathrooms. 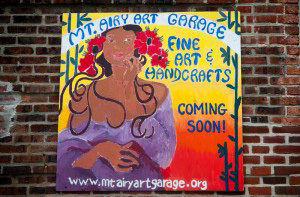 http://mtairyartgarage.org/wp-content/uploads/2011/07/DSC_7042-web-300x197.jpg 197 300 Arleen http://mtairyartgarage.org/wp-content/uploads/2016/06/maag-in-action_main-1024x274.png Arleen2011-07-10 21:03:332019-01-30 15:24:09Ready, Set, Build! 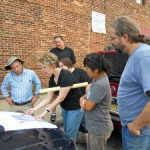 Movin’ and Shakin’ with MAAG Design Charette Dreaming Part 2…Our Storefront!